8:30 am: Picking up at the hotel. 9:00 am: Starting the tour with Vietnamese coffee. 9:30 am: Visiting the countryside of Hue city and discovering some handicraft villages to learn and interact with local people – to see how they live; to learn how they make living with their traditional jobs; and to experience their daily life. 11:30 am: Continuing to visit riding through many local villages to Thanh Toàn tile-roofed Bridge in Thanh Toàn village, Thủy Thanh Commune, Hương Thủy District, about 8 km from Hue city. Here we will enjoy the peaceful scenery of the countryside with farmers working on their tranquil rice fields, talk to friendly local people in the small market and learn more about their daily life. Also, We have chance to visit the agriculural museum where they set up perfect way to show you all about local customs, traditional way for cultivating at rice paddies. 12: 30am: Then riding to “DAM CHUON – CHUON LAGOON” – Đầm Chuồn is located in An Truyền Village, Phú Vang District, about 15 kilometres from Hue City and is a part of Tam Giang lagoon system. It is a must-see spot for all those who are scenery lovers and photographers. 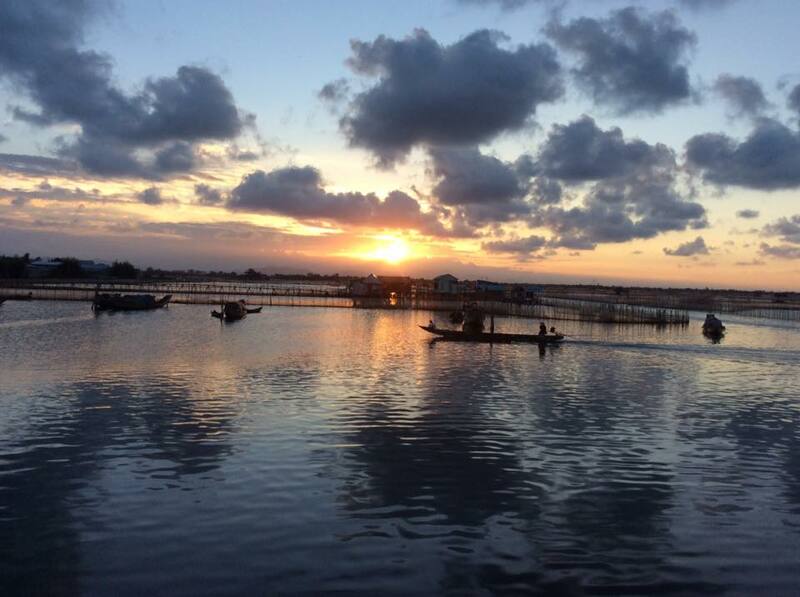 At sunrise and sunset, the tranquil Đầm Chuồn appears like a water-painting masterpiece beyond any standards of beauty. WE take a small motorboat to the lagoon area, take photos of the amazing scenery on the lagoon, and may have lunch at BAMBOO FLOATING RESTAURANT enjoy some boiled fresh seafood at shrimp farming houses. Then you will EXPERIENCE the daily life of local FISHERMAN – LEARN how to catch fish from the nets and fishing traps. This is REAL fun and experiences with local people. 16:30 pm: We then ride back to town and FINISH TOUR.